These bags (originally made to contain rice) are quilted so they have a bit of structure to them, and being square and flat bottomed sit nicely on the floor or on a shelf when full. I made the larger one above - great for knitting wools or a crochet project perhaps - and the smaller one below which could happily contain a stack of fat quarters. The construction of the bag is quite straightforward, and you could make up the exterior in any way you like and to any size you want so I don't include measurements but just show how I constructed my two versions, with instructions for assembling the bag in another post. If anything is unclear, or if you find it difficult to work out your own measurements, please do let me know. Exterior version 1 - Liberty Crazy Patchwork panels. The sides of this bag have a crazy patchwork panel. I was lucky enough to get the chance to practice one method of crazy patchwork with Sheila at the Stitch Gathering. You can find many tutorials on Google but the pics below show how I made the panels for this bag. Scraps of Liberty tana lawn (I used a maxi scrap pack from Very Berry Fabrics, or use leftovers from another project) for making the Liberty panels. Four pieces of plain white cotton - for backing your Liberty panels - they should be just a little bigger than your intended Liberty panel. For your crazy patchwork it helps to start with a five sided scrap (1). 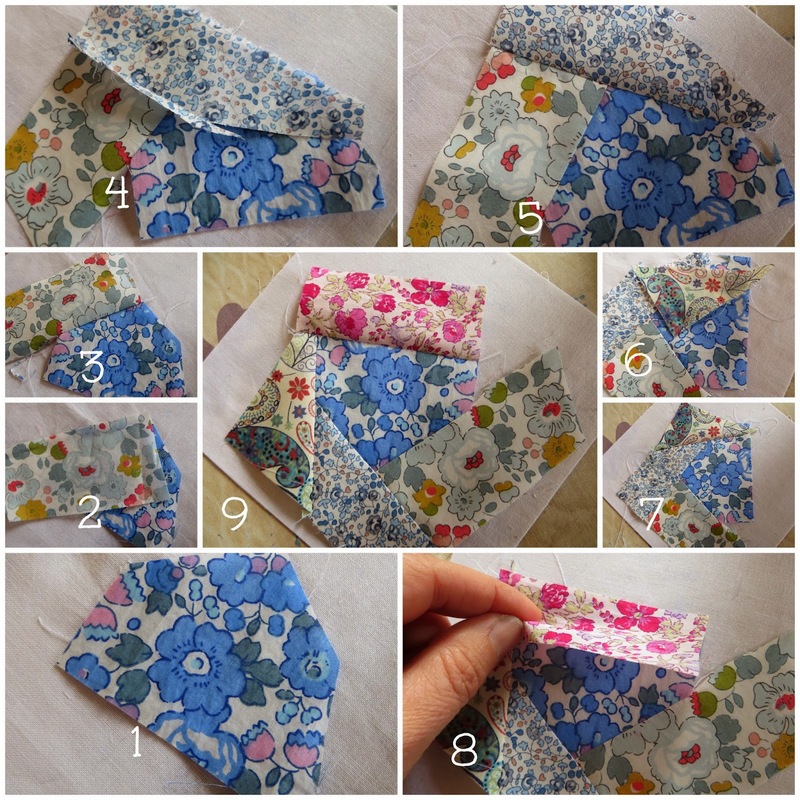 Sew a second scrap to your first piece (2), trimming the seam, opening out and pressing (3). Carry on working your way round your first piece one scrap at a time covering the previous raw edges (4-9). Trim the seams and press as you go. Keep an eye on your panel as you go - use your ruler to check whether it is the right size, and when it is, to cut your finished square selectively from it. Here's another finished square - spot the deliberate mistake. The piece on the bottom right hand corner isn't big enough, leaving an unfinished edge flapping. I corrected it by adding another piece. TIP: You can make crazy patchwork by sewing your pieces to a foundation fabric, but it makes it difficult to trim the seams and in this case the excess fabric shows through the fine tana lawn. Take your piece and affix it to the one of your pieces of backing cotton using a small stitch round the edge to avoid fraying. 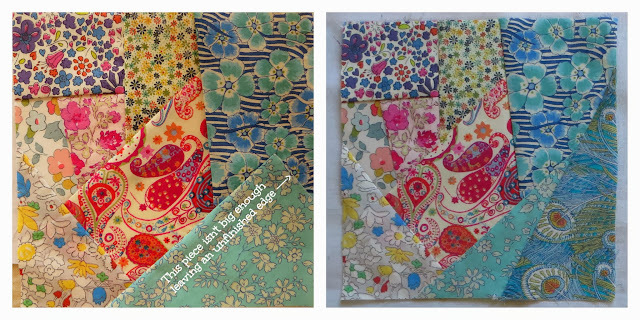 At this stage you can embellish the seams with a fancy embroidery stitch if you like, as is traditional in crazy patchwork. Then trim away the excess backing. Working to your own size, this is what you need! You will need to cut two side strips from your sashing fabric - I chose to make them something between 2/3 to a half of the panel width - and attach them. and top strips. NOTE THAT YOU NEED TO MAKE YOUR TOP STRIPS 3/4 INCH TALLER THAN THE BOTTOM ONES. Press carefully. I pressed all my seams towards the linen rather than have their bulk show against the tana lawn. Now you can think about quilting your panels. I did some running stitch in perle 8 round each crazy patchwork piece. scraps of Liberty tana lawn big enough to cut into 36 squares of equal size which include a quarter inch seam allowance all around. My squares finished at 1inch, so started off as 1.5 inches. I was able to use leftovers from my first bag. four squares of plain cotton with length of side 3 times that of your mini squares - ie mine were 4.5x4.5 inches. To make these nine-patch panels I adapted the method used by Ali to make coasters . I took each square of plain cotton and folded it vertically into thirds, pressing the folds, then horizontally into thirds, pressing the folds. I then opened it out and sprayed it with spraybaste (505). Then I laid out my Liberty squares carefully using my fold marks as a grid to help placement. The spraybaste holds in place while you sew the seams. First sew the vertical seams, cut along the folds so you can open out the seam allowance and press the seams open. Repeat with the horizontal ones. Then proceed as for crazy patchwork bag. Once the sides and batting were fixed together the patchwork panel was quilted in the ditch. This a great tutorial! The instructions are clear and the photos help a lot. Would love to make this bag one day. For now, Catherine your work inspired me to make a small step forward on my sewing adventure and try something new. :-) I am off to my sewing machine. Thank you! just got a little liberty yesterday, maybe I should give this a go. Maybe this will encourage me to cut into my small Liberty hoard so that I have scraps to use for the crazy patchwork panels. Is that the wrong way round to think ?? Lovely to see you continue with the Crazy techniques. Love this bag, must Pin it for another time, thank you. This bag is absolutely gorgeous! Love it!